Abdelbari Atwan, publisher and editor-in-chief of the London-based pan-Arab daily al-Quds al-Arabi, today says he hears through the grapevine that the die is cast for a Syria war finale in June. My unimpeachable Arab sources suggest the United States has already passed on the information -- which was understandably short on details -- to trusted regional allies. 1. The majority of the Arab region’s wars and invasions took place in the summer months, mostly June. They include the 1948 War, the 1967 Six-Day War, the 1982 Invasion of Lebanon, the 2006 Lebanon War and the 1990 Invasion of Kuwait. The revolutions of 1952 in Egypt and 1958 in Iraq also took place in the summer month of July. 2. Last week’s report in The Times of London that a soil sample taken out from a neighborhood on the outskirts of Damascus, and smuggled out of Syria in a secret British operation, appeared to provide the first forensic evidence of chemical weapons being used in the ongoing fighting. 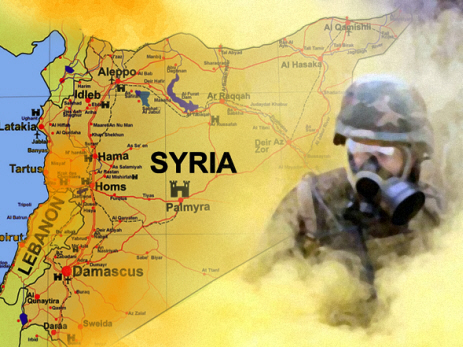 The sample could not indicate whether regime forces or rebel fighters fired the chemical. 3. A report by CNN last week saying that under pressure from Democrats and Republicans, the Joint Staff of the Pentagon and the U.S. Central Command have updated potential military options for intervention in Syria. 4. Reports that the intensive training in Turkey and Jordan of small, CIA-vetted groups of FSA fighters by special American and British forces will conclude around mid-May. 5. The European Union’s embargo on the shipment of arms to Syria will expire end-May, allowing Britain and France to supply antiaircraft and antitank weapons to Syrian opposition forces. 6. The impasse over terms of the UN deploying a chemical weapons inspection team in Syria. Damascus has asked for the UN team to investigate what it says was a poison attack by rebels in Aleppo’s Khan al-Assal last month. But Damascus has rejected demands by the opposition that the inspectors also be sent to investigate other locations where rebels say government forces used chemical munitions. The leak about British Ministry of Defense scientists establishing conclusive proof that chemical munitions are used in Syria was not meant to ascertain freedom of expression or The Times’ credentials. It was meant to serve another purpose, which we know little about for the moment. But the disclosure does evoke the story of Farzad Bazoft, the Iranian-born British journalist who was sent to Baghdad in 1989 to fetch a soil sample from near a nonconventional weapons complex. Months after the incident, Iraq was isolated – and the rest is history. Some six months ago, U.S. President Barack Obama started warning that Syria’s use of chemical weapons would cross a red line and could change his calculus about intervention. Significantly, Syrian opposition leaders Moaz al-Khatib and Ghassan Hitto met with several of the G8 ministers on the sidelines of the London talks. This shows we’re inching closer to the scenario of the Iraq invasion coming in the wake of the Iraq sanctions and embargo. The Iraq scenario kicked off with the March 1988 use of poison gas against the Kurdish town of Halabja that killed 5,000 people. The Homs neighborhood of al-Bayyada could well become Syria’s Halabja and Bashar al-Assad could in turn become the new Saddam Hussein. The evidence-gathering process is gaining pace in Syria to justify and legitimize military action that seems imminent. The pressing question is: Will the military action start with no-fly zones and the qualitative arming of the opposition in order to induce a bigger involvement by Iran? Or will it start in the framework of a joint American-Israeli-Arab war against Iran and Syria together? Iran is in the frame because Israel believes the Islamic Republic will have the bomb by year’s end. The big difference between the Iraq and Syria scenarios is that when it faced the embargo, the Saddam regime stood alone. Mikhail Gorbachev’s Russia was broke and in a state of transition and China was building up it economic muscle. In contrast, Iran, Hezbollah and Russia and its four BRICS partners – namely, China India, Brazil and South Africa – are standing behind the Assad regime. Ironically, the hot summer month of June comes this year some 40 days ahead Ramadan. I won’t be surprised if it turned out to be the most incendiary in the Arabs’ history.